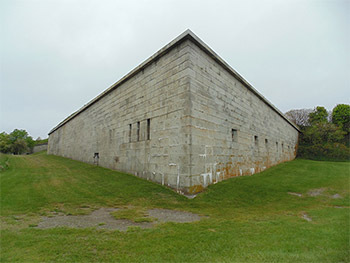 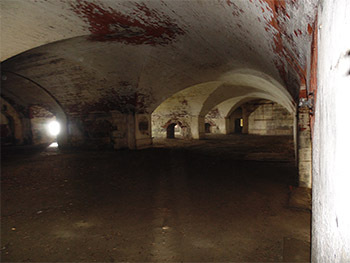 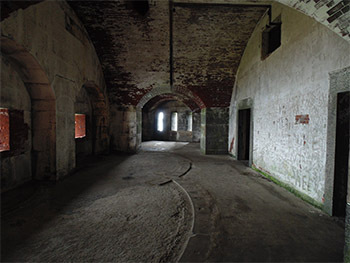 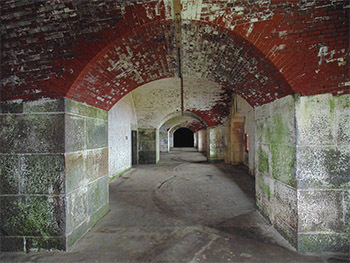 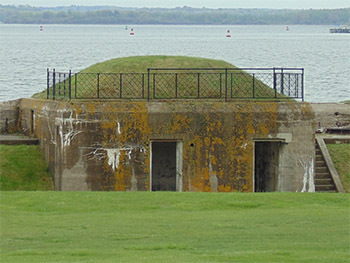 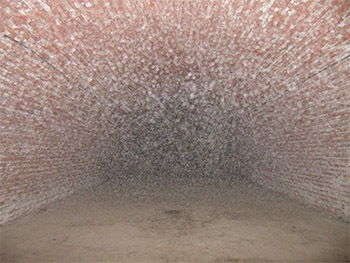 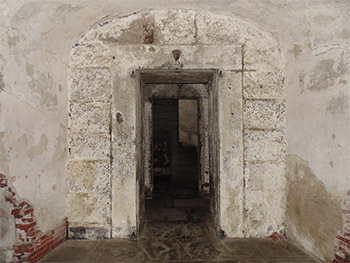 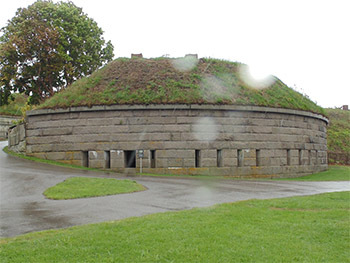 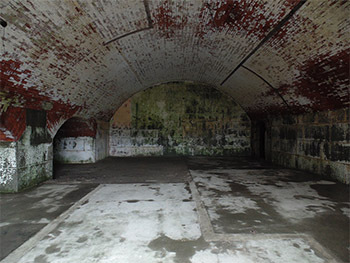 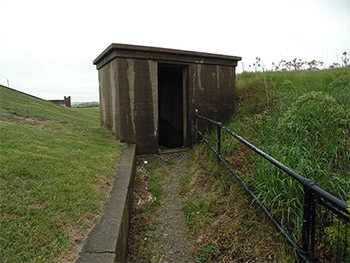 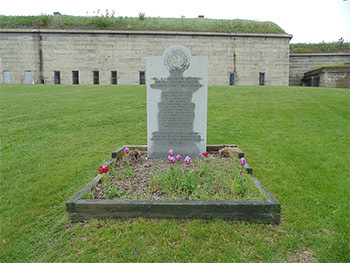 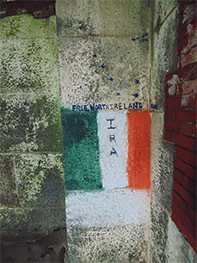 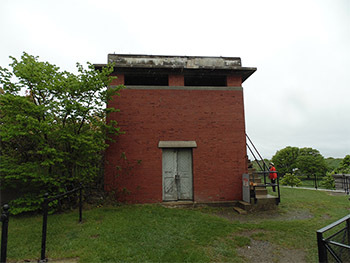 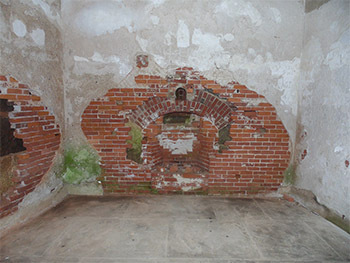 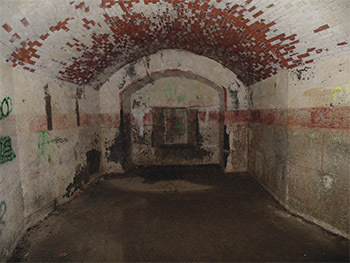 Visit the Starforts.com Fort Warren page here! 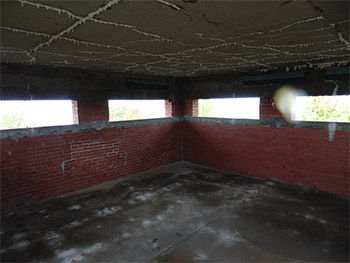 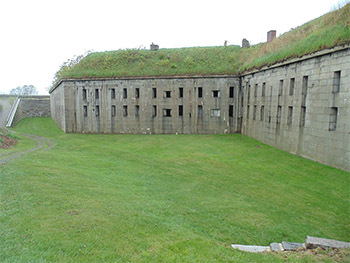 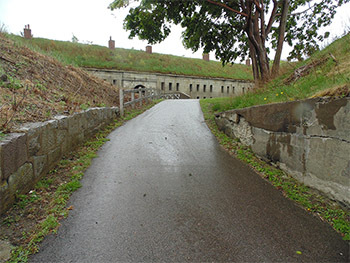 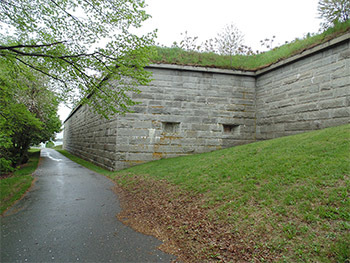 Fort Warren is one of the most expansively impressive starforts that I have yet had the pleasure to visit. 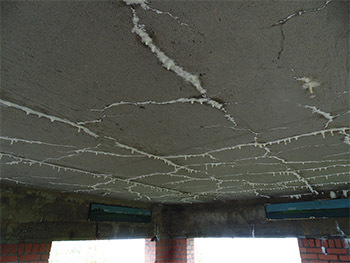 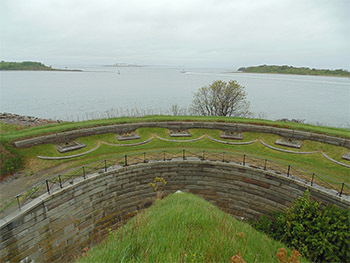 Having its own nice, flat island upon which to exist, its builders were not hindered by geological or urban constraints. 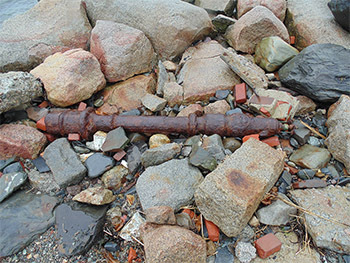 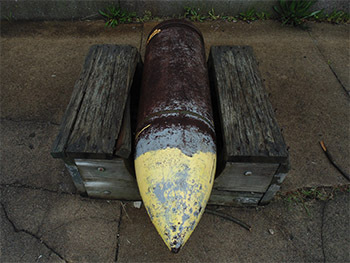 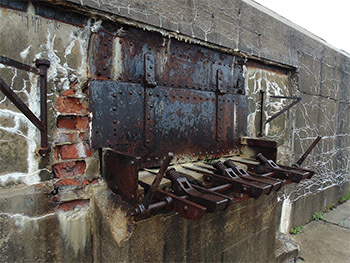 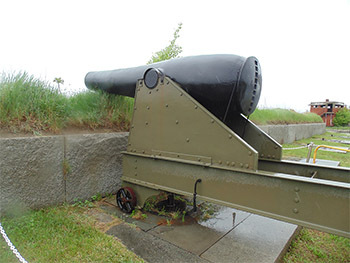 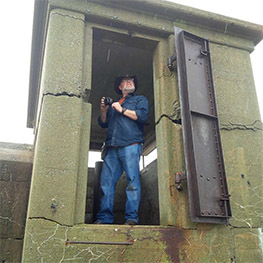 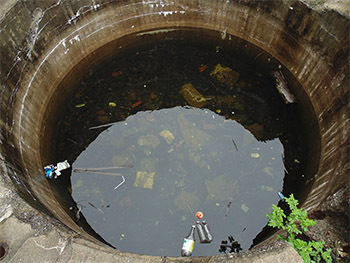 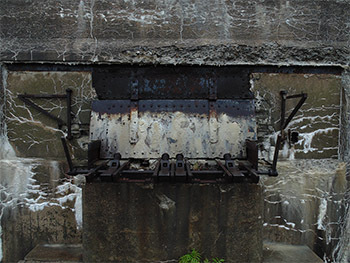 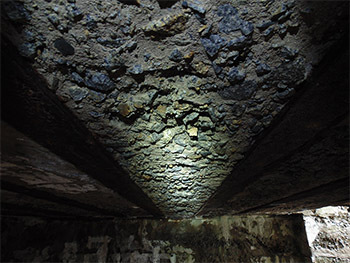 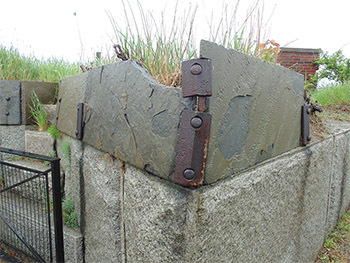 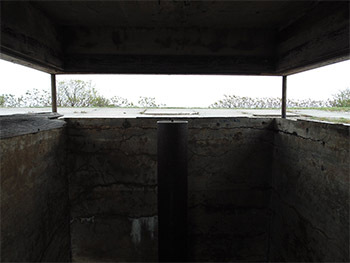 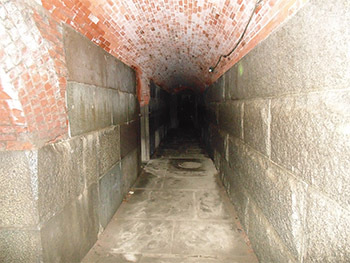 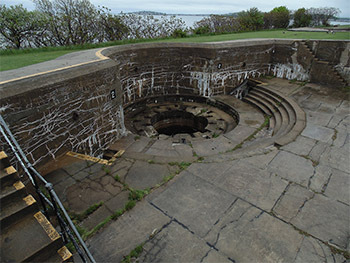 It was considered Boston's first and most powerful line of defense against any seaborne foe for nearly a century, and thus no expense was spared in its construction or maintenance. 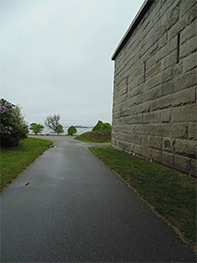 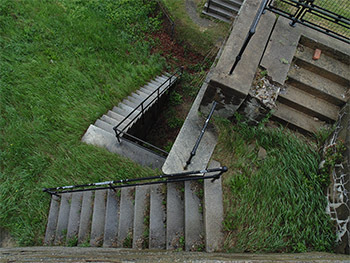 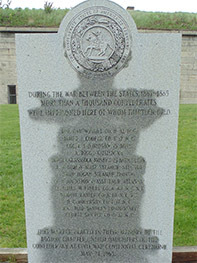 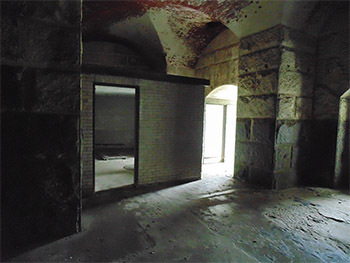 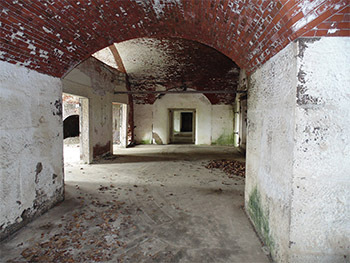 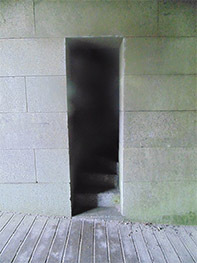 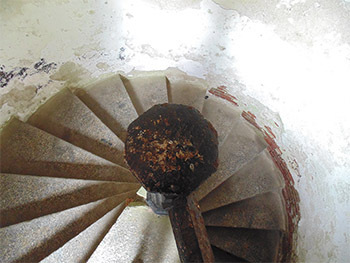 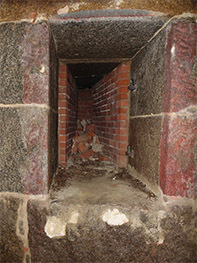 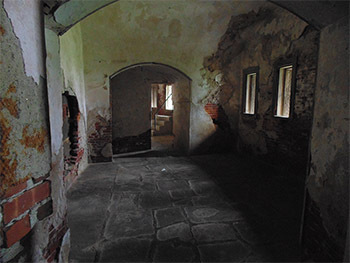 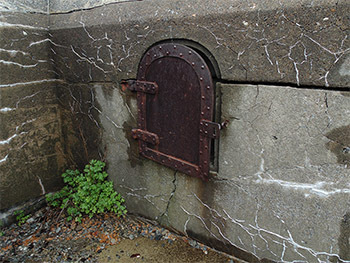 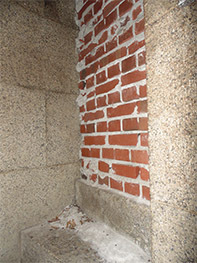 Getting to Fort Warren proved to be an adventure, in that...it's on an island, about seven miles from downtown Boston. 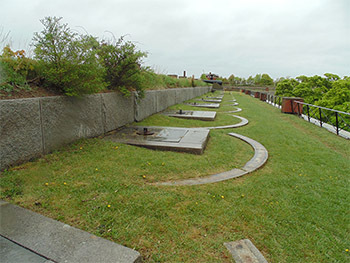 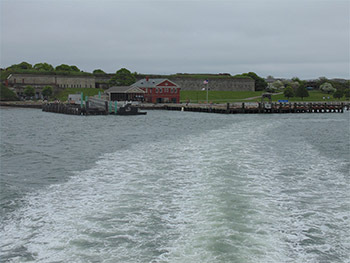 Ferries regularly bring visitors to Georges Island and the various other islands in Boston Harbor. 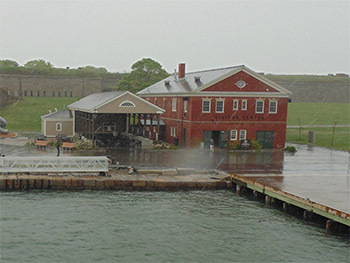 I and my intrepid starforting sister naturally chose to visit the island on a rainy day. 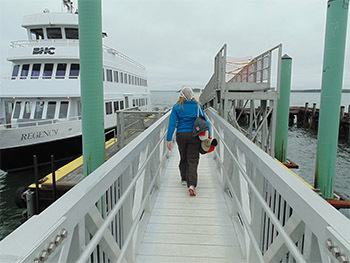 Because what's more pleasant than a seven-mile ferry ride? 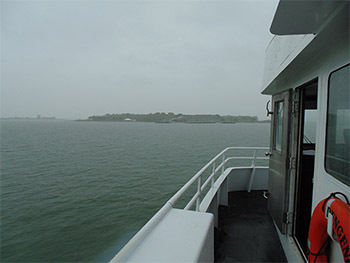 A seven-mile ferry ride in the driving rain, of course! 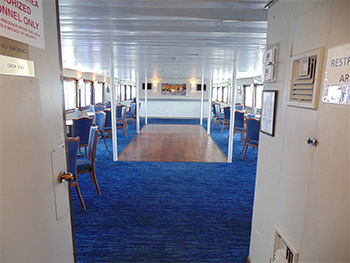 We made our journey of wetness aboard the Regency, a three-deck ferry big enough to support its own dancefloor (and snack bar! 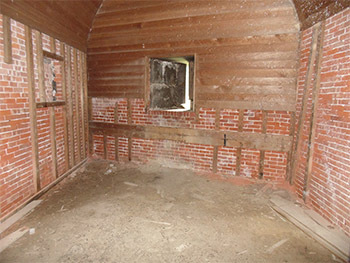 Score!). 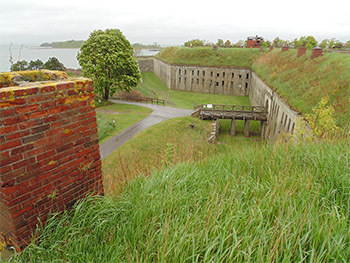 This trip cost $34 for the two of us: While access to the fort is "free," you of course have to get there somehow. 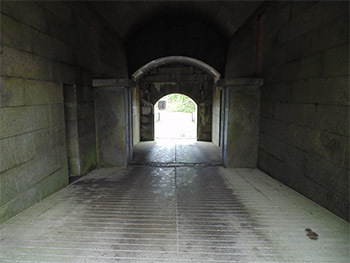 It being a less-than-ideal day to tromp around outdoors, we were joined on the Regency by a grand total of three other people, plus the crew, who greatly outnumbered all of us. 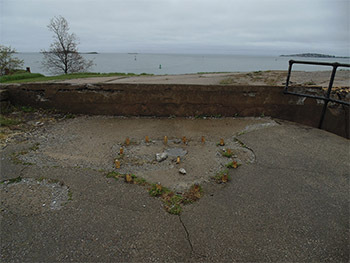 The island itself was manned and womaned by a crew of adorable young park rangers who, though clearly bemused that anyone would be as enthusiastic as we to be where we were in the pouring rain, were nonetheless extremely helpful and nice. 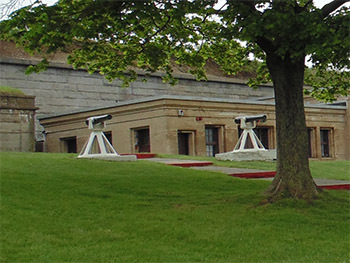 The Visitor's Center, conveniently placed right at the island's dock, was pretty good: lots of information about the fort's history and what life was like for those assigned thereto. 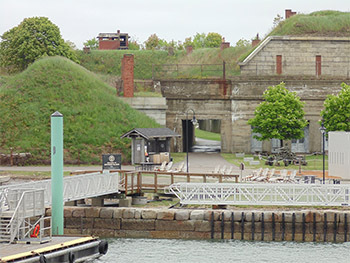 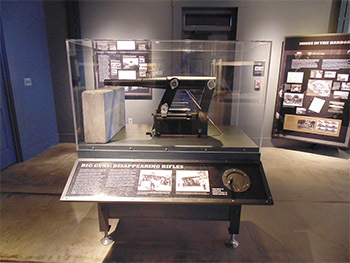 Most of this information was in the form of signing, but there were several interesting exhibits, including a scale model of a 12-inch Disappearing Gun that was fun to play with. 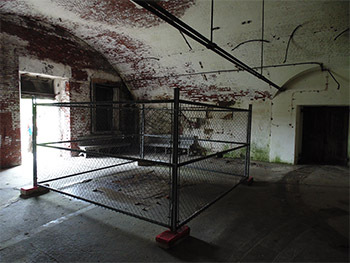 There was a small gift shop within the Visitor's Center, but it was locked up tight, and no amount of pleading would compel the nice rangers to open it for me. 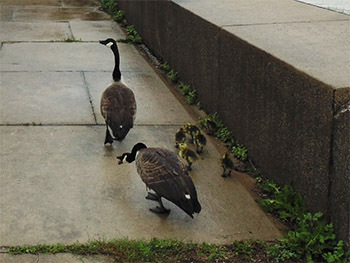 Not unexpected this early in the year and on a day when nobody in their right mind would make this journey anyway, but still mildly disappointing. 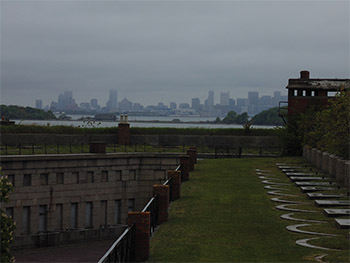 Because if you know me, you know I'm all about the gift shop. 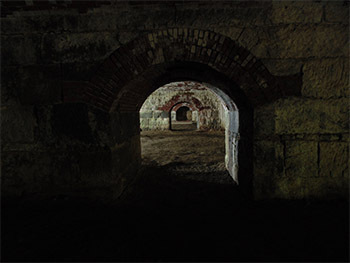 For the most part it was difficult to concentrate on anything at the museum, as I was both dripping wet and champing at the proverbial bit (I wasn't actually wearing a bit) to get into the starfort of my current proximity. 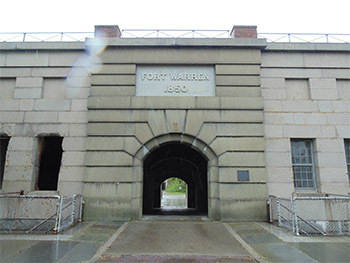 I really didn't know what to expect from Fort Warren, but it was a breathtaking collection of delightful surprises. 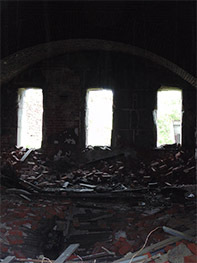 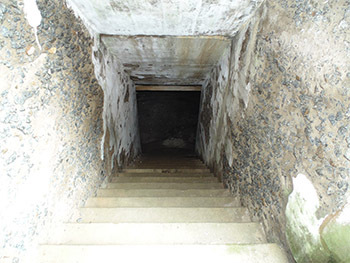 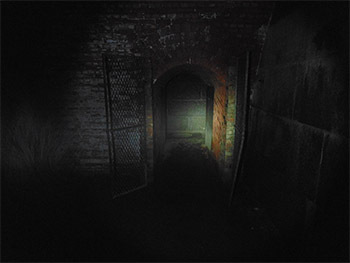 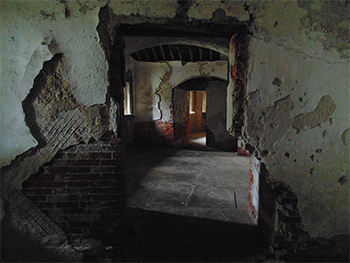 So many delightful dark, dank spaces to explore. 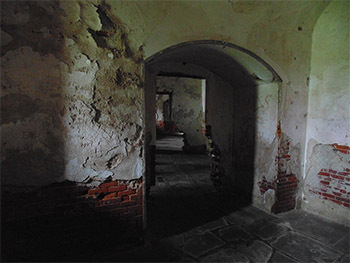 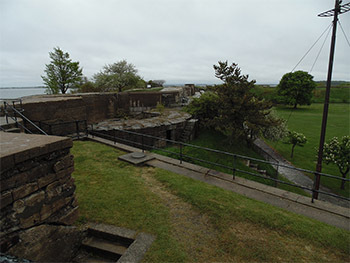 The exterior walls are in great condition, there's a decent amount of informational signing (and roaming Park Rangers) for the visitor's education, and lots of charmingly ugly Endicott Period batteries built right inside the Civil War-era fort. 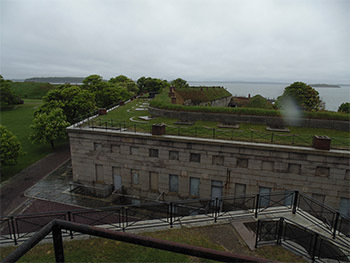 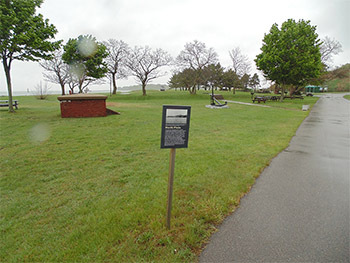 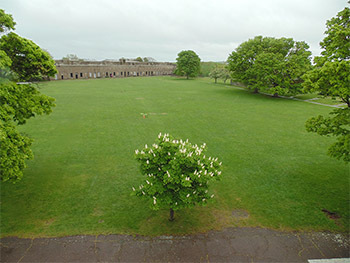 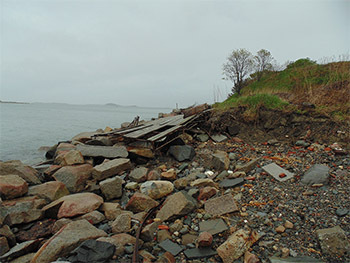 Unfortunately we didn't get the chance to see everything Georges Island had to offer, because the rainy day, which had mostly cleared up during our visit, proved to be our undoing. 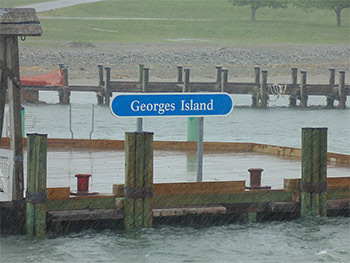 After about two hours of exploration the park's head Ranger sought us out and politely asked if we might possibly depart with them on the ferry that was about to leave the island...otherwise we would be the only ones left on the island, which sounded perfectly peachy to me, but would have been a rather needless expense for another ferry to come back out just for us in a few hours. 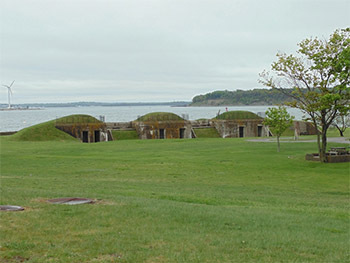 We were offered free ferry tickets so we could return to Georges Island on any other day in the Spring or Summer of 2015...Which weren't really of any use to us, as we would be leaving Boston the following day for an inspection of the starforts of Maine, but it was a gracious gesture on their part. 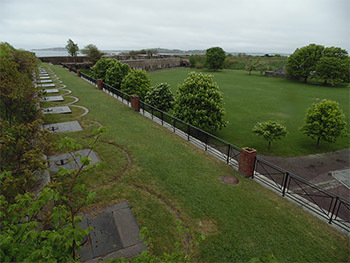 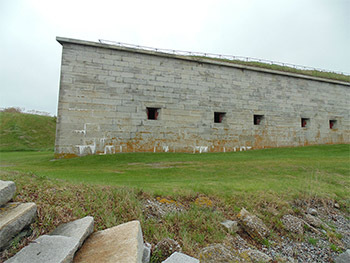 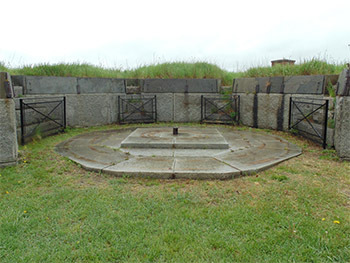 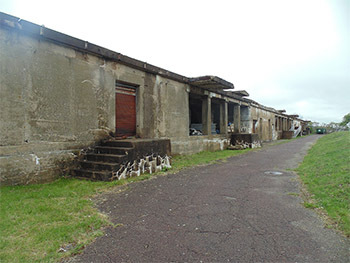 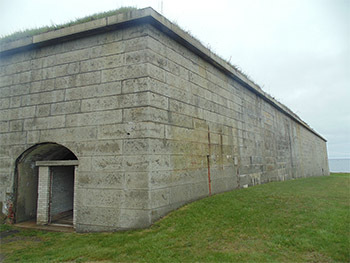 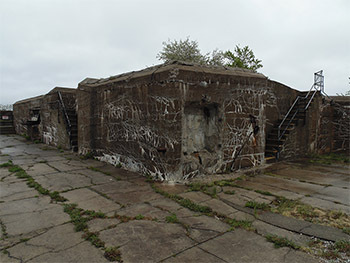 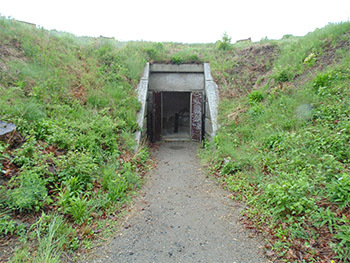 We were able to visit the vast majority of the fort during our stay, with the exception Battery Lowell (an Endicott battery for three 3-inch guns on the island's southern tip), and Battery Bartlett (an Endicott battery for four 10-inch guns, which was where the park service's maintenance equipment is stored, and is thus closed off from visitors). 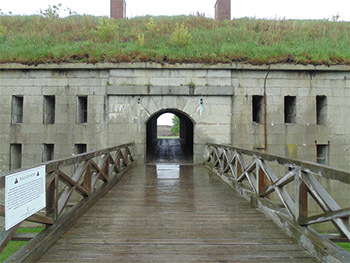 Plus, we didn't have time to circumnavigate the fort, which may not have been physically possible anyway. 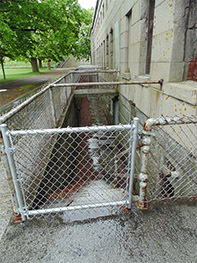 Just in case anyone is unclear on how this works, please click on any of the images on this page to be brought to its full-sized counterpart, along with further brilliant observations related to my visit to Fort Warren.